Tall, narrow trees planted close together are the traditional solution for lessening wind on a larger scale. 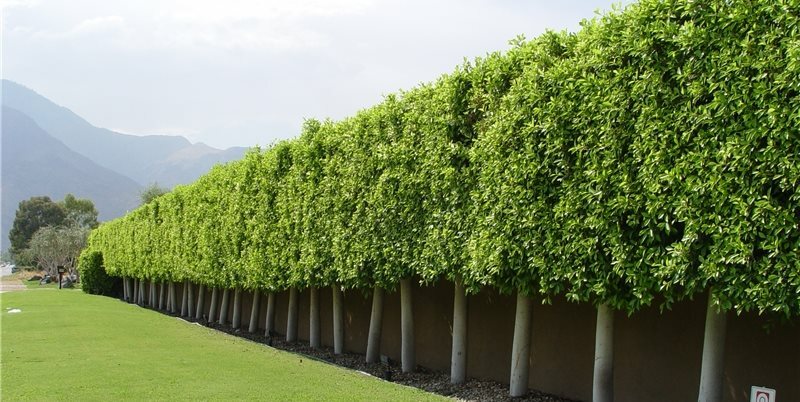 This ficus hedge is composed of trees that reach thirty feet tall but are mercilessly sheared to this limited height, which is both cost and labor intensive. 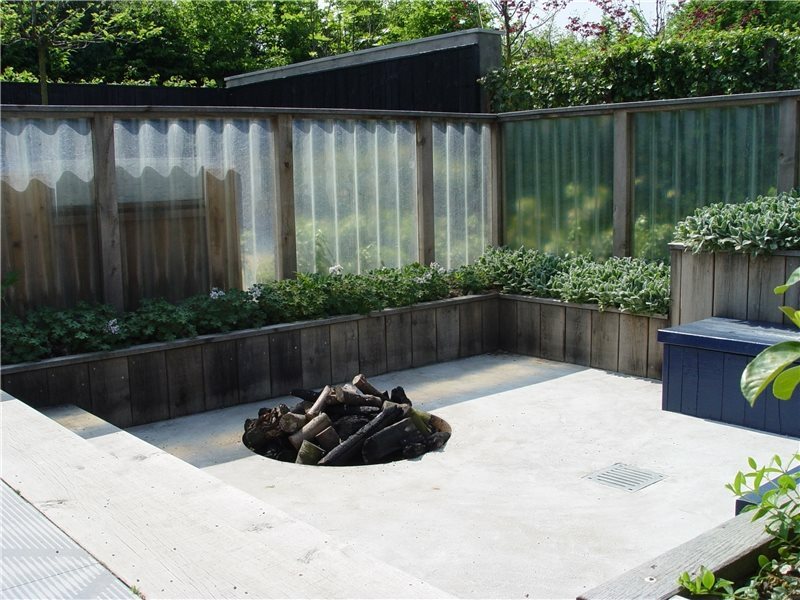 This firepit is protected from the wind by a wood wind screen featuring translucent fiberglass panels. 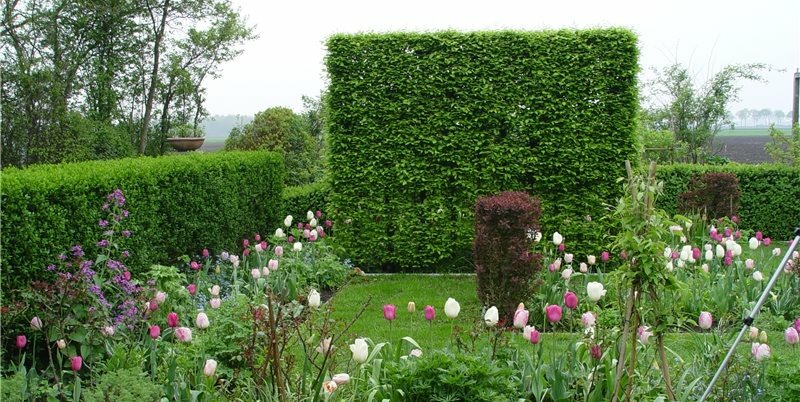 Hedges can be created at any size or thickness to protect against wind while preserving windows out to the view. Each type of shrub offers different qualities to a windbreak hedge from color to texture and most important: density. In areas of extreme winds and weather, ultra strong wind screens prevent damage during storm gales. 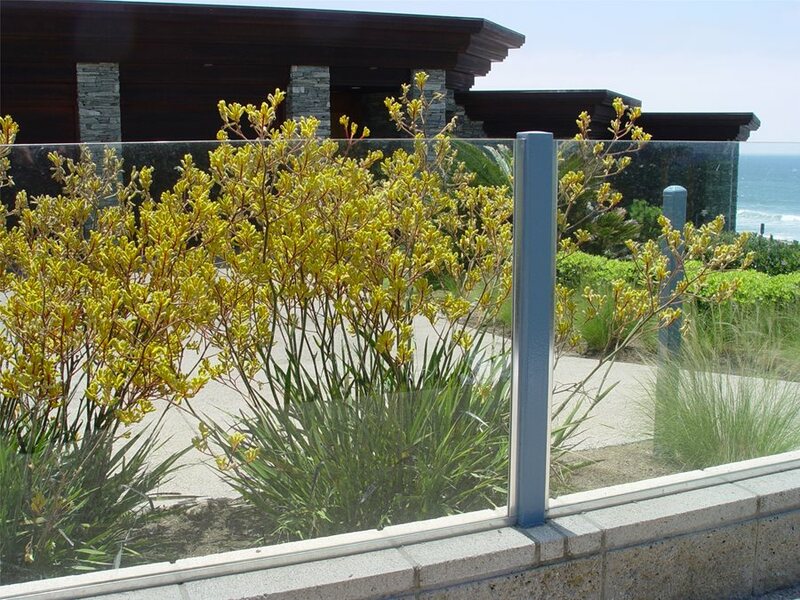 In areas where wind control is necessary but building codes don't allow fences, hedges can provide the ideal solution. This simple small scale wind screen provides privacy, warmth and window views for a less closed-in feeling. This wind wall with its blue glass block and outdoor art makes the deck much warmer in the transitional seasons of spring and fall. A fine example of using plexiglass to control wind without sacrificing the view. If wind is a chronic problem at your house, a new landscape can offer near perfect solutions. 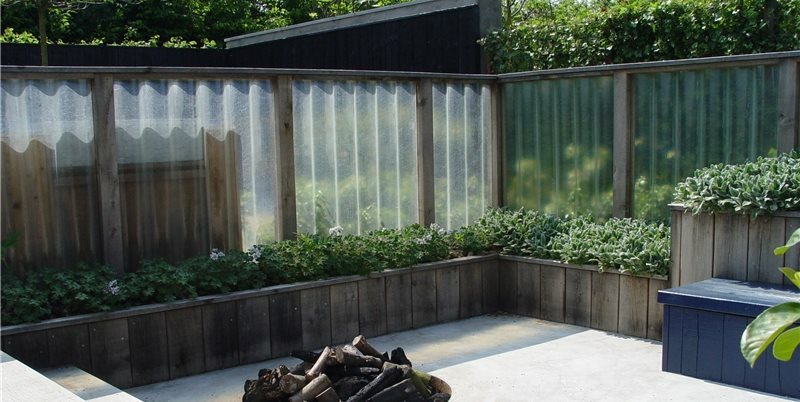 Within its design you can create effective windbreaks that protect specific outdoor living spaces to make them far more comfortable. You can also use large scale windbreaks to protect your entire homesite, just as they do on the prairie. The three options detailed below offer solutions, each with a different scale, price and time to effectiveness. 1. The man-made wind screen. 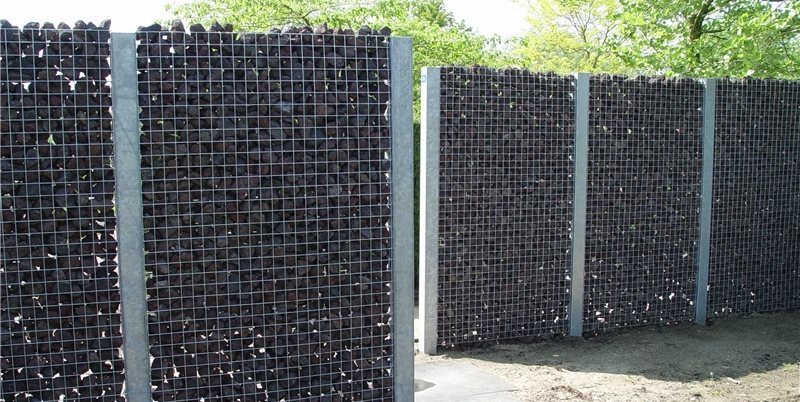 A wind screen is basically a fence or wall that blocks the wind. 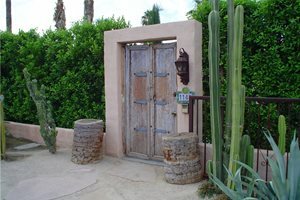 These are highly effective at deflecting wind away from small often-used outdoor living spaces such as a patio or deck. 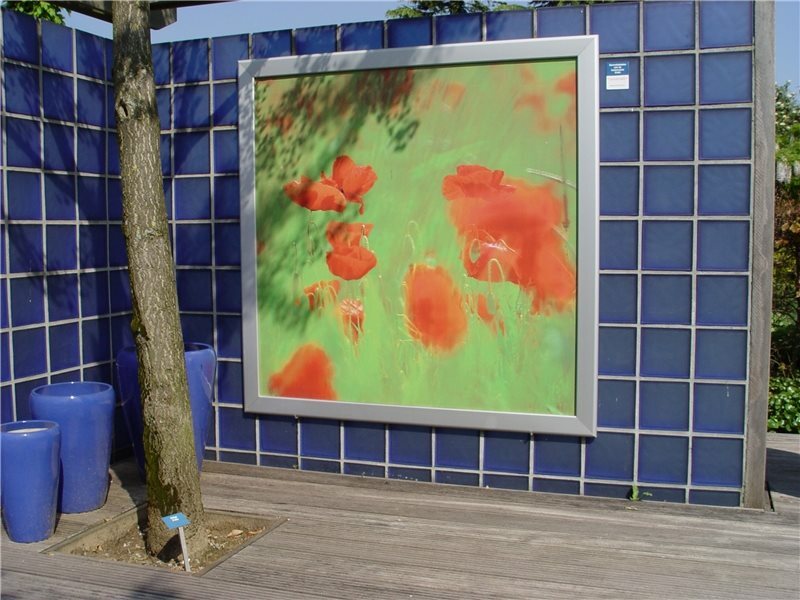 Screens are also used around a spa or pool area to trap and build heat for bathers. 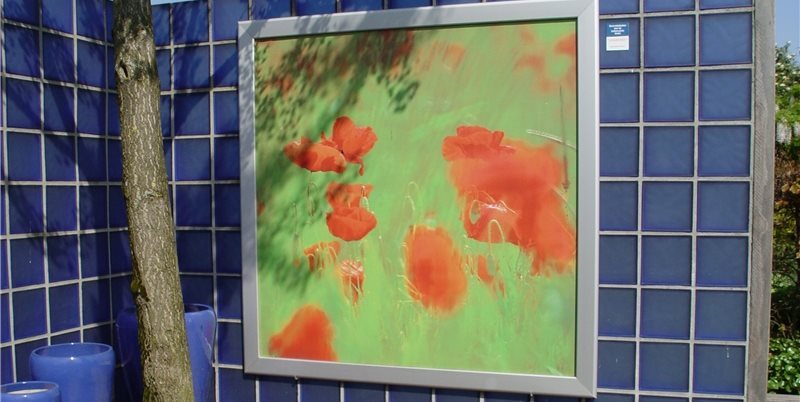 A wind screen can be made out of semitransparent material to allow light to pass through. Sometimes they can be clear Plexiglas to preserve a view while blocking the wind. The man made wind-screen is effective the moment it's completed. The cost can be high, though, particularly when dealing with transparent materials. Simple board screens used for wind control are more costly than fences because they must be stronger, particularly in high wind homesites. The lateral pressure on the posts may require larger concrete footings, metal pipe and bolts to prevent weakening over time. Tip: The taller the windbreak, the larger the protected area will be on the lee side. If the wind screen is built along a property line, the height is limited to six feet by building codes. Wind screens within the property lines may be taller, but increased height requires more expensive structural support. Beware of further height limitations within planned communities. 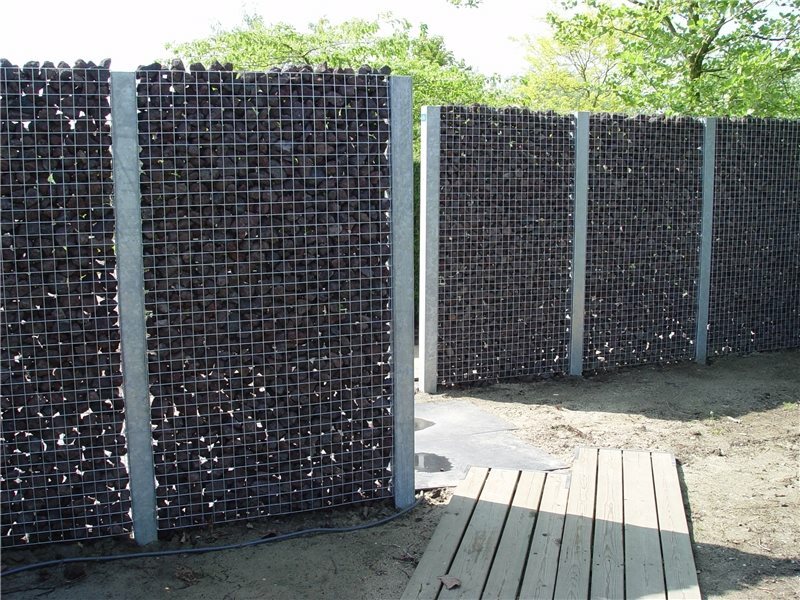 A more affordable alternative to built screens is a shrub hedge windbreak sized for the space. 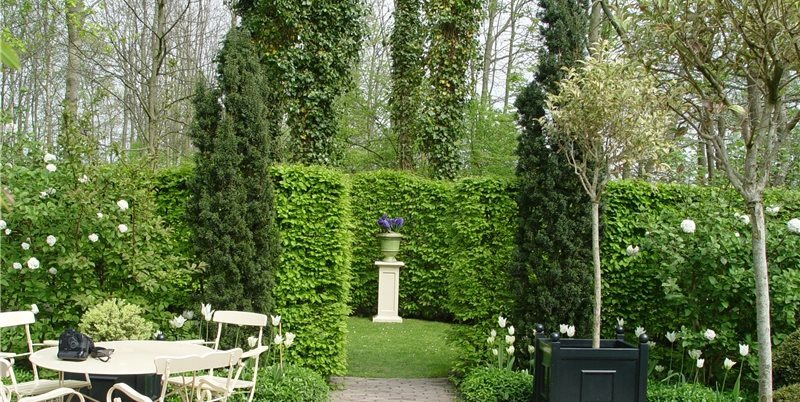 Short dense shrub hedges around living spaces or just on one side can be highly effective. These allow users to sit in the protected area while gazing over the top of the barrier at the view. When large 10-foot tall shrubs are used, they make a solid windbreak and privacy screen for a patio, deck or an entire small yard. 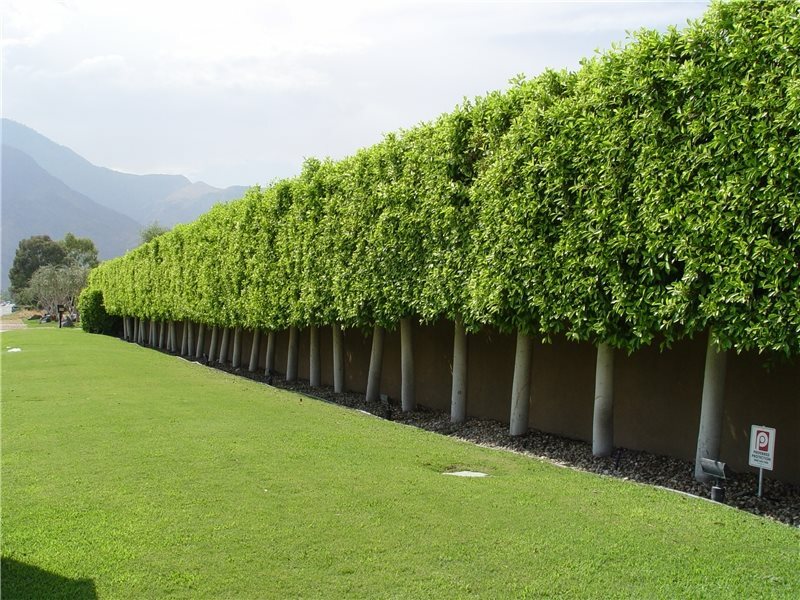 Unlike solid built screens, shrub hedges block from 25% to 60% of the wind. A dense needled evergreen hedge will be far more effective than a broadleaf one. 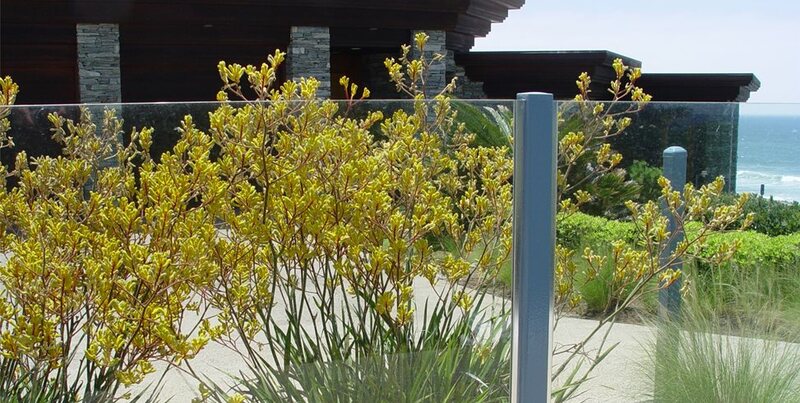 This permeability of shrubs can be more desirable than solid built barriers in very hot or humid climates where moderate wind penetration is welcome in the summer months. 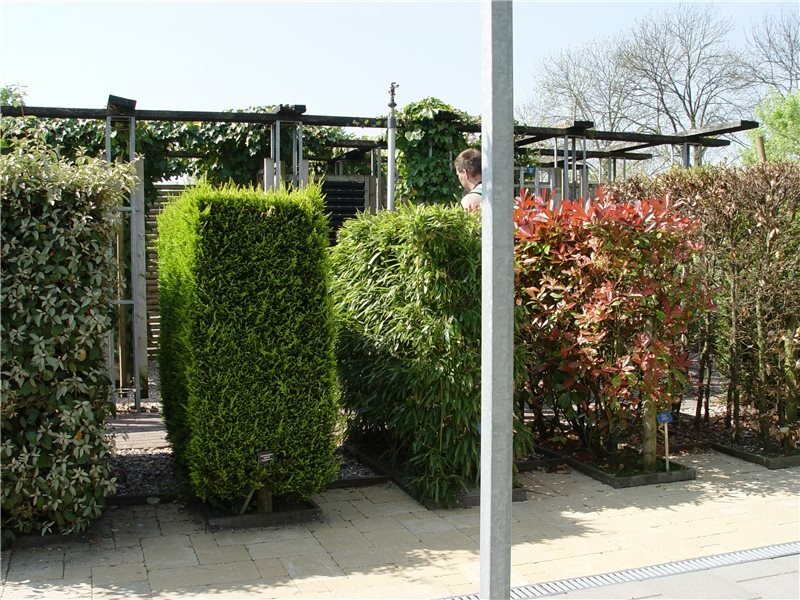 As plants, shrub hedges take time to mature and reach their full effectiveness. Height is set only by the plant's natural dimensions, or it may be controlled by regular shearing. 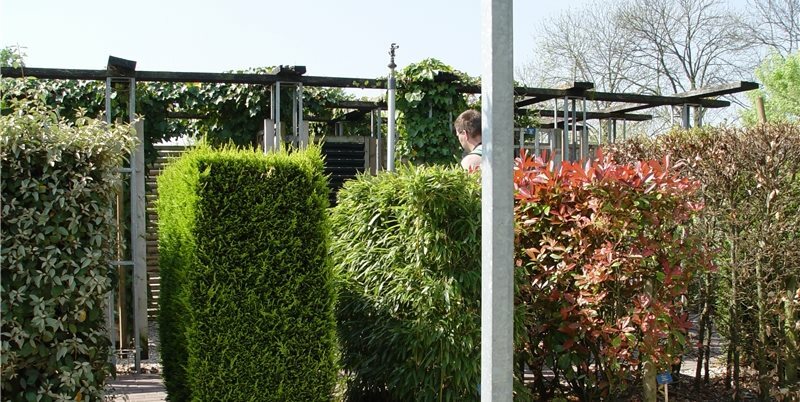 However, it is always best to select the shrubs by their dimensions to fit naturally into the hedge so there is no need for this costly, high maintenance process. 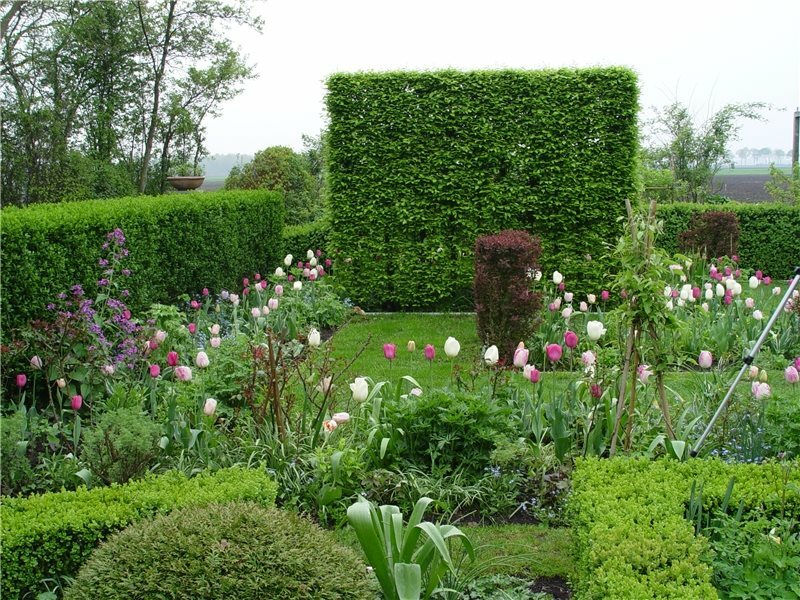 In the past, traditional hedges were planted in one species, but designers are moving toward a more diverse combination of different shrubs for protective diversity. That way if a disease were to strike one of them, there are other plants remaining to maintain wind control. This was the case when a new disease struck millions of oleander windbreaks, leaving as many homesites without vital protection. The shrubs should be well chosen for compatibility, foliage density, longevity, adaption to local climate as well as overall pest and disease resistance. 3. A windrow of trees. Windrows are old time agricultural plantings to protect fields, orchards and homesites. 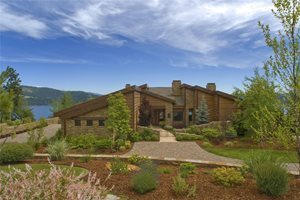 It can work just as well for your homesite to significantly change the microclimate because trees can grow well over thirty feet tall, thus protecting a considerable area. There is no other way to create a similarly sized wind barrier. 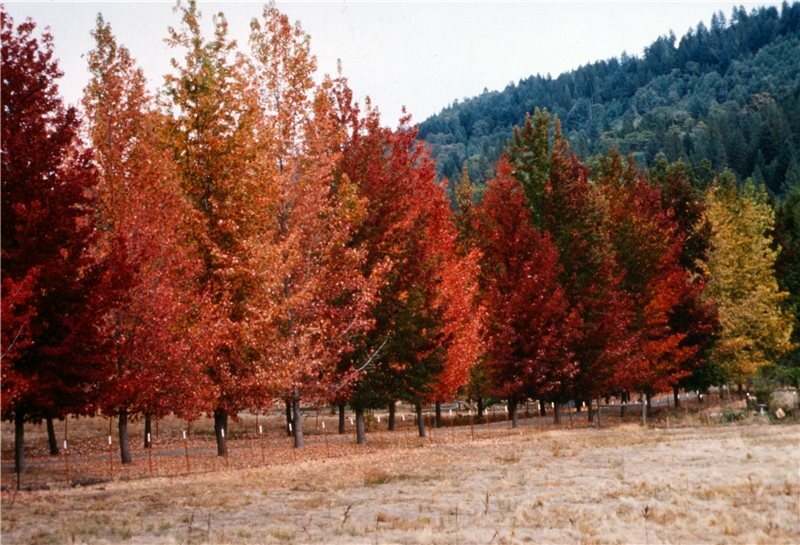 A windrow is simply a single row of identical trees planted very close together. Windrow trees tend to be tall and narrow. They must be tolerant of other trees within its root zone. Above all, they offer a dense combination of branching structure and foliage for maximum wind blockage. Here too, the single species windrow is evolving into a multiple species one to protect against loss through diversity. The down side to using trees for wind control is that they take time to mature. The early years may have little to no reduction in wind. Planting larger older trees is not viable because they will not have time to develop a sufficient root system to anchor them against gale force winds. 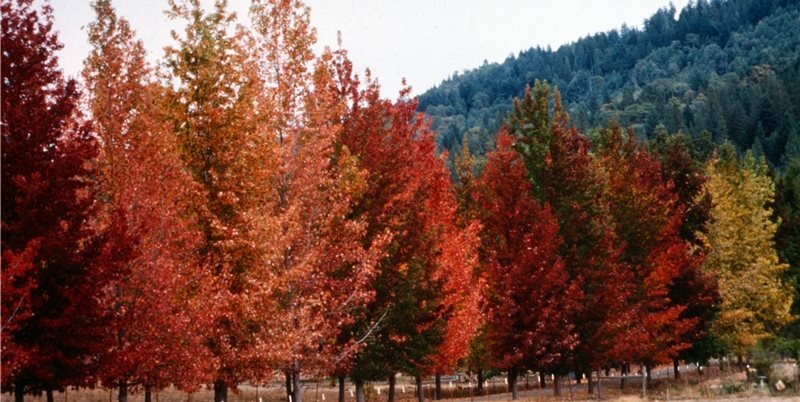 The Natural Resource Conservation Service is the government resource for information on windbreak trees species for planting in every part of the United States. Windward side: The exposed side of a windbreak that faces the wind. Lee side: The protected side of a windbreak opposite that which faces the wind.